Family owned and operated as the Best Steakhouse, #16 since 1967. 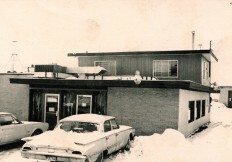 It proudly served the greater Lansing area as a traditional Steakhouse for over 45 years. In 2004, the family introduced a cheesesteak sandwich named the “Steakhouse Philly”. By 2012 the “Steakhouse Philly” accounted for the majority of sales. A decision was made to focus on our cheesesteak sandwiches, Greek food, and other creative offerings. In 2013, a total renovation commenced. On March 10, 2014, the family reopened as Steakhouse Philly Bar & Grill, honoring the sandwich that helped make it all possible.